Unbroken 14th century defensive wall and charming Renaissance centre. 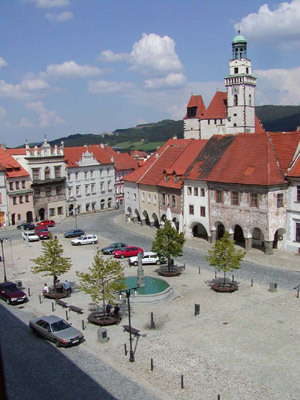 The town of Prachatice was founded in the 13th century on the Golden Trail ("Zlata stezka") which led from Bavaria to Bohemia, and gained its wealth thanks to trade in salt. Prachatice has almost unbroken 14th century defensive wall and charming Renaissance centre, best preserved in the region. The old Prachatice is one of few towns that really is prettier than its postcard. I am looking for a real estate agent in Zablati u Prachcatice...can you help me? My friend and I wish to travel from Prague to Prachatice, then to Cesky Krumlov. What would the best way to do this?